the latest and the sharpest vision ever....Period! Since 1959, with the invention of the worldï¿½s first progressives, Varilux has innovated lens technology to advance the standards of vision. 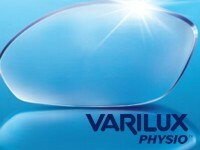 Today, this innovation leaps light years ahead with the introduction of Varilux Physio: the most advanced, general wear progressive available. For the first time, Essilor introduces the W.A.V.E technology adapted from the wavefront technology used in laser surgery to correct vision by eliminating surface aberration, to literally correct the distortions generated in even the best progressive lenses.